Scattered remains of the office SAFEBOX and other office material after the break-in. 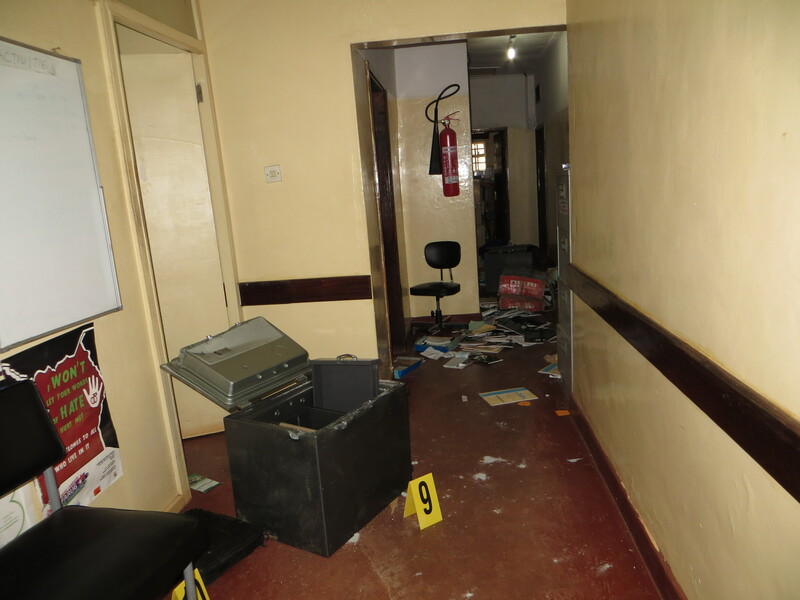 On Sunday night the Human Rights Network-Uganda offices were broken into by unknown persons. The office security system was completely disabled, the server taken and two safes broken into. Other equipment such as computers, surveillance cameras, sensitive files, reports were also taken. Investigations to verify actual inventory of the stolen and vandalised items is ongoing. The break-in at HURINET-U follows a trend of similar occurrences on organisations involved in human rights promotion and protection in Uganda. Previously, we have seen organisations like ACCU, FHRI, EHAHRDP, AGHA among others broken into under similar circumstances. Usually information stores and servers are targeted with potential aim of derailing their work. As National Coalition for Human Rights Defenders we are concerned by the increasing trend of targeted attacks to premises of human rights organisations. We implore Human Rights Organisations to remain steadfast in their work and such acts should not in any way be deterrence to their continued promotion and protection of Human Rights in Uganda. “We call upon the government to provide protection to civil society and we wish to emphasize that the UN Declaration on HRDs imposes that duty on the state” stated Ms. Margret Sekaggya, Executive Director Human Rights Centre. 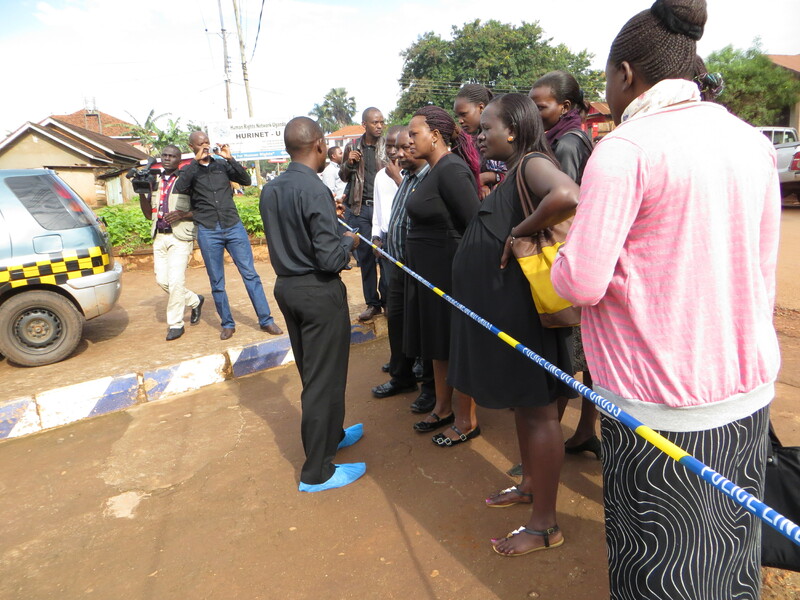 We call on the Uganda Police to expeditiously invesigate circumstances under which such incidents occur. 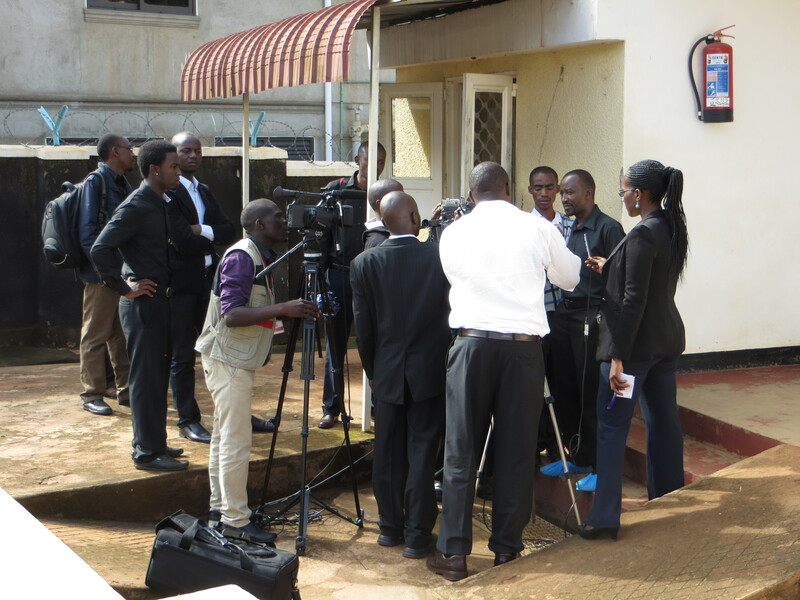 HRDs in Uganda continue to face attacks and threats from the state and non-state actors. The fluid operating environment characterized by restrictive legislations, threats of closure of proactive NGOs, leaves HRDs vulnerable. 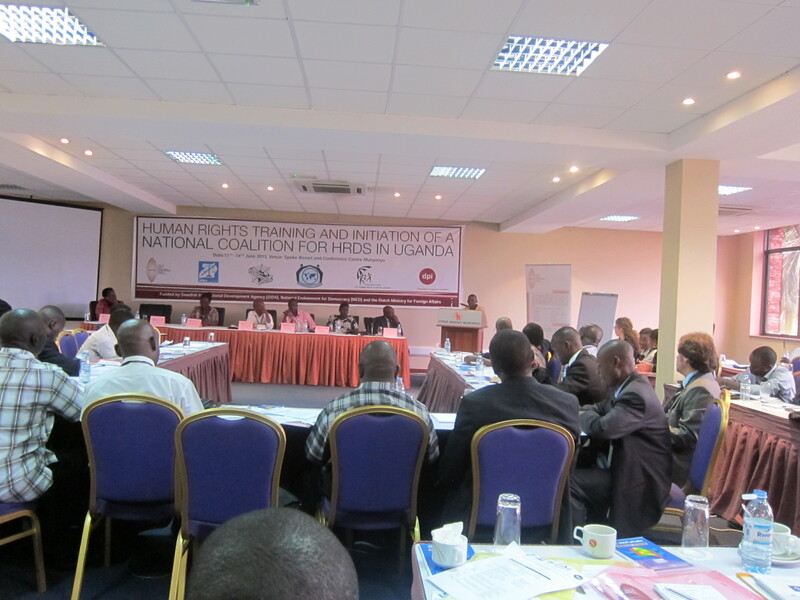 This Coalition was established following extensive field research undertaken by Human Rights Center Uganda (HRCU) and East and Horn of Africa Human Rights Defenders Project (EHAHRDP) in the region, which identified the most pressing and unmet needs of human rights defenders in order to overcome some of the resulting challenges. The National Coalition of Human Rights Defenders – Uganda (NCHRDs – U) is a loose organization of various Human Rights Defenders (HRDs) that was launched in June 2013 during a training of HRDs organized by EHAHRDP. Its founder members are; Human Rights Network Uganda (HURINET-U), Foundation for Human Rights Initiative (FHRI), EHAHRDP, NGO Forum, Avocats Sans Frontieres (ASF), Human Rights Network for Journalists (HRNJ), Defenders Protection Initiative (DPI), and HRCU. HURINET–U serves as the Secretariat of the Coalition representing more than 80 members. It seeks to strengthen the work of HRDs throughout the country through synergy and collaboration at national, regional and international level. It also seeks to enhance the protection mechanisms for HRDs and their capacity to effectively defend human rights. NCHRDs–U focuses its work in all the regions in Uganda and embraces all defenders regardless of race, color, gender, religion or political affiliation. Without significant efforts at the national level, regional and international efforts are increasingly limited in their scope and long–term outcome. The Coalition envisions a region in which the human rights and dignity of HRDs in Uganda as stipulated in the Universal Declaration of Human Rights 1948 (UDHR) and other international human rights instruments are respected and upheld. Its mission is to enhance, protect and promote the work of HRDs in safe and secure environment and to enhance the awareness of human rights work through linkages with national, regional and international like–minded entities. 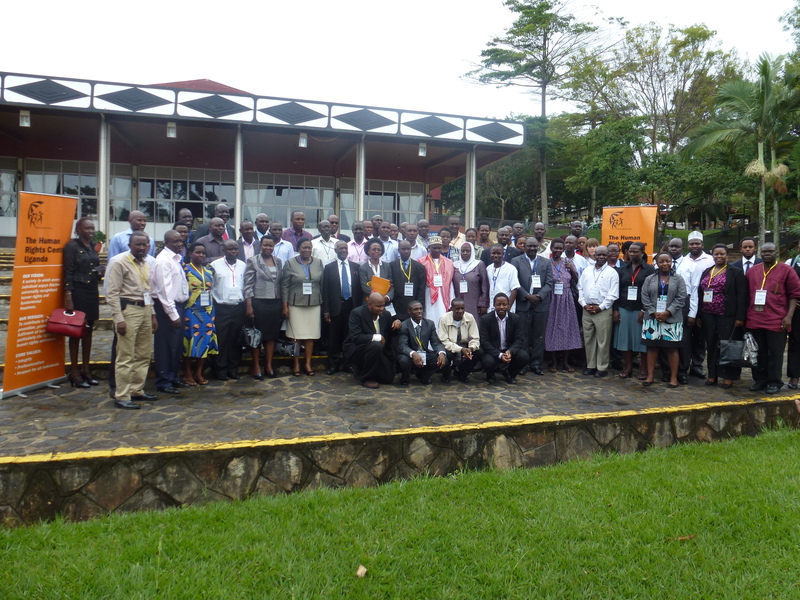 HRDs from across Uganda participating at the first ever National HRD Forum in March 2013 organized by the Human Rights Center Uganda. It is at this forum that the first discussion on the formation of the national coalition for human rights defenders was held.